Don't forget to visit this hidden gem on Orcas Island during your next trip! When visiting Orcas Island, Moran State Park is a must-see attraction, and even more so if you're a lover of the outdoors. Moran is probably most well known for its observation tower at the top of Mt. Constitution offering majestic views of the surrounding islands, mountain ranges and even distant cities, but there are also some fabulous hiking trails that you should check out. For those that are looking for hikes that are short enough to complete in a few hours or less, and are not extreme elevation changes, we've highlighted our favorites here, with full description on how to get there and some photos along the way. Keep in mind that most hikers average about 20-25 minutes per mile hiked (less if extreme elevation climbs are involved). This will help gauge distance and timing if you're interested in some hikes but are pressed for time. If you're looking for a short, but visually amazing hike, with a series of beautiful waterfalls, then Cascade Falls is your ticket. The shortest distance is traveling just beyond the entrance to Mt. Constitution. There's a parking lot clearly labeled which provides a short path just a few hundred yards to some amazing views of Cascade Falls. Although it's a short hike (less than 1/4 mile), it is fairly steep to get down to the base of the falls. The hard part is making it back to the parking lot as it's vertical ascent can be daunting, but there are some great viewpoints to allow you to catch your breath. If you're in for a short hike with some great views, you won't be disappointed here. Best during spring and early summer. Why we like it: It is an amazing view and quick to access. How to get there: Drive up Mt. Constitution Road about .25 miles, parking is located on the right side with signs to Cascade Falls. Then follow the clearly marked trail to the falls. The Cascade Lake loop is one of the most popular hikes in Moran. It's easily accessed from the main parking lot as you enter the park and the trail leads you around the north and west side of Cascade Lake. The elevation change is relatively flat for about half of the 2.7-mile trail (primarily around the lake and toward the South Campsites) but begins quite a bit of elevation change as you cross the street. Why we like it: Good distance hike (approx 3 miles) and relatively flat. How to get there: The main parking area at Cascade Lake and head on the trailhead to the right (north side of Cascade lake). Alternately, you can cross the street and access the trailhead that starts you south along the hillside. The Cold Springs Trail is also easily accessible from the main parking lot as you enter Moran as well. This is on the east-side of the road, and can also be accessed from the campsites. This one is quite a bit more challenging as there is fairly constant elevation gain throughout the climb. But, with the effort, there are also many rewards, including a series of amazing waterfalls as you ascend the 2.9-mile trail. For those that are not interested in the entire 3 mile one-way hike, you can capture some amazing views well before the top. This picture below is from the ~1.2-mile mark - making the hike about 2.5 miles round trip. Why we like it: Amazing scenery with waterfalls in several locations on the way up. It is also a somewhat challenging climb with constant elevation gains. How to get there: the same parking lot as Cascade Lake - follow the trail signs to Cold Springs. 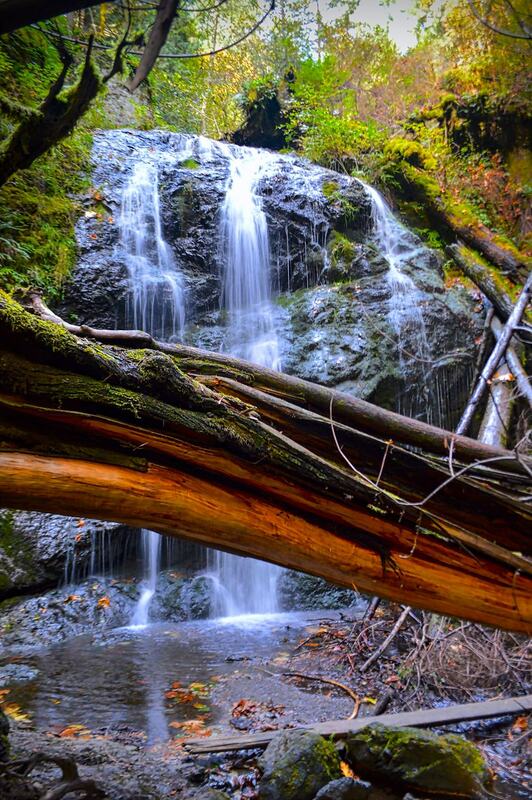 You're sure to find some amazing hikes during your time on Orcas Island. Use this link to access a full list of trails in Moran State Park during your visit and let us know if you have a favorite trailhead. There are well more than 3 great hikes in Moran, so we couldn't leave out the Mountain Lake Loop. This is a 4-mile hike around Mountain Lake as you're heading up Mt. Constitution. This is a relatively flat hike for the majority as you're near the lake edge for most of the hike. There is some elevation climb on the opposite side of the lake, but there are some really great views from this hike as well. Get your FREE copy of the Insiders Guide to Amazing Hikes on Orcas Island. Just click the image below to begin planning your hikes! © 2015-2019 Orcas Island Getaway, LLC. All Rights Reserved.